C.J. Bobbit got the scoring started to put the Aggies up 2-0 within the first minute of the game. Thanks to a nice pass from Trevelin Queen to Ivan Aurrecoechea, the Aggies found themselves in the lead 7-6 going into the first media timeout. A fading back three from Jonny McCants with the shot clock winding down gave the Aggies a four-point lead around the 13-minute mark. Shunn Buchanan found Jonny McCants for the alley-oop around the 12-minute mark to give the Aggies the 16-13 lead. After a timeout by Auburn, Jojo Zamora knocked down a three to give the Aggies the lead 19-15. The Aggies then let the Tigers go on a 10-0 run and gave up their lead. The Aggies were down 19-25 and were forced to call a timeout with about six minutes left in the first half. After not scoring for nearly seven minutes, Jonny McCants converted a layup and got a free throw to fall after being fouled on the shot. The free throw got the Aggies to within six points of the Tigers. A hard foul on Terrell Brown put him on the free-throw line and he was able to convert both to bring the Aggies to within four with about two minutes left in the first half. The Aggies finished the first half on a 10-4 run and headed into the halftime break down 29-32. Much like the first half, the Aggies started the second half with the first bucket on a layup by Terrell Brown. The Tigers came out of the second half nailing all of their shots and the Aggies were trailing 45-37 around the 16-minute mark. Trevelin Queen finally found his stroke after hitting a three with about 13 minutes left in the game to bring the Aggies to within eight. The Tigers kept hitting their three-point shots and were leading the Aggies 59-48 with about nine minutes left in the game. The Aggies could not get their threes to fall and found themselves trailing by 13 with seven minutes left in the game. Trevelin Queen hit a three with five and a half minutes left to bring the Aggies within six. The Aggies were able to cut the lead to three with less than a minute left in the game. After Jonny McCants made one of two free throws, the Aggies were able to force a turnover and were only down four with 40 seconds left in the game. Trevelin Queen made a deep three to bring the Aggies within one point of the Tigers. After the Tigers made a pair of free-throws to get their lead to four, Jojo Zamora hit a three to get the Aggies within one point again. Down two, Terrell Brown got fouled shooting a three, but was only able to make one of the three free-throw attempts to bring the score to 77-78. 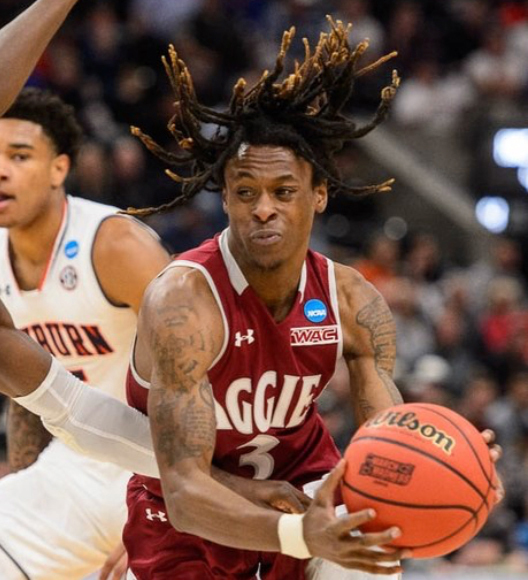 Trevelin Queen was able to get a great look for the final shot of the game, but was unable to convert and the Aggies lost their first-round matchup to the Auburn Tigers 78-77. The Aggies finished the season as WAC regular-season and tournament champs with an overall record of 30-5. The Aggies have not won an NCAA Tournament game since 1993 when they were the No. 7 seed and defeated the Nebraska Cornhuskers in the first round.